When we are talking about cakes, there are two things to be kept clear in mind which are just not negotiable. Let it be whatever type of cake you’re talking about and for whatever occassion it is being made for, these two things are (I repeat) “JUST NOT NEGOTIABLE”! Those two things are; how it tastes i.e. the flavour and taste of the cake and how far has it managed to please your eyes or more simply put; the cake’s flavour and the cake’s design. Below are some completely unique ideas for how your cake should look like specially chosen for your wedding day. The royal blue peacock sits on top of the white cake, being a cute cake topper, and its turquoise tail has been continually elongated all the way from the top of the cake till the table and has ended up into cute little cupcakes. All of which is arranged so beautifully so that it looks like a nice little peacock resting on the cake. The cake is a graceful white and lot of emphasis has been laid on the table decor. I can see candles lit under the table and a few of them kept on the top of the cake table. You must be wondering why the cake is called a fountain cake. Where exactly is the fountain? The fountain is resting in the center of the tower-like cake stand on which rests the Papa Cake and then there is a Mama Cake on the right with a Baby Cake infront of the Mama Cake (if you know what I mean). Here comes another graceful white easy-to-cut cake for your wedding. It is not just a simple white cake but we can see a lot of effort being put into it. In fact it is not only a white cake; there is a bit of beige here and there. Beige floral cake topper and a beige chiffon ribbon carefully placed around the first floor of the cake. All in all it is a good cake to opt for. There is a pink three-storey cake for the bride to cut with many more cute pink cupcakes, marshmallows and other candies around it, to serve them to your guests. This fairy-tail like pink cake is ideal for a soft pink wedding theme or any other fairy-tale like wedding theme. You may, however, change the colour of the cake according to the chosen wedding theme. This idea would be most loved by the kids. 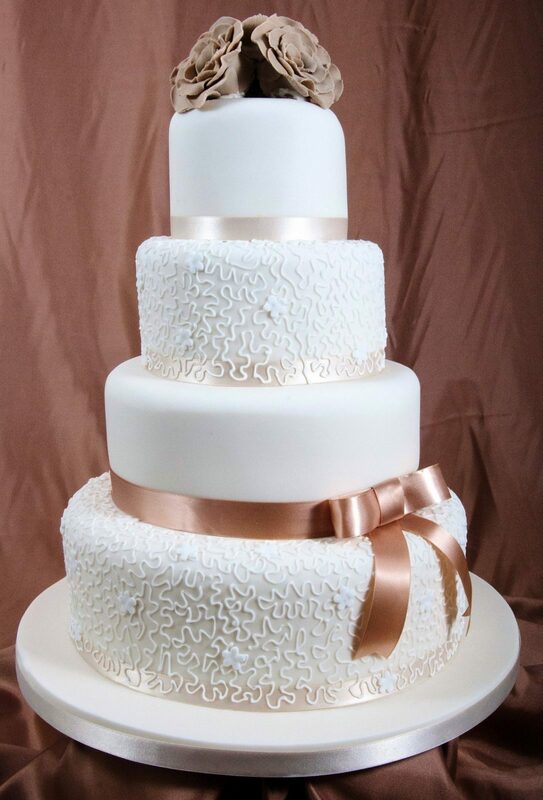 Here we have another graceful white cake for your wedding day. You must be thinking what’s new about this cake. Well, new is the idea of putting a unique cake topper on your cake. It may be any other unique cake topper you choose; the condition is to be a unique and uncommon one. People tend to underestimate rainbow cakes thinking that they are a little too colourful for your wedding but the whole idea behind choosing a rainbow cake for your wedding is to add a little colour to your wedding. I’ll tell you what can make it even better; the cake beneath every colour should be of a different flavour. YES! SEVEN DIFFERENT FLAVOURS TO ENJOY!